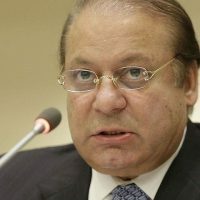 ISLAMABAD: Former prime minister Nawaz Sharif expressed regret over the assault of a private television channel cameraman and said the behaviour of his security guards had damaged his reputation. Journalists staged a protest on the arrival of Mr Sharif in the accountability court on Tuesday. Mr Sharif, however, went straight to the courtroom to attend the trial proceeding in the Flagship Investment reference. During the mid-break, he met the reporters in the office of the Islamabad Bar Council and responded to their questions about the incident in which his security guards assaulted and injured cameraman Wajid Ali of Samaa TV on Monday. Mr Sharif said his security supervisor Abdul Shakoor was clearing his way and escorting him towards his vehicle on the premises of Parliament House. All of a sudden the cameraman emerged as I was getting into the vehicle. When Mr Shakoor pushed him away, the cameraman hit him back causing a minor injury to his (Mr Shakoor’s) face, he said. “I left the Parliament House and was later informed that my security guards had beaten up the cameraman and injured him. “Such acts are uncalled for and cannot be tolerated by any means. I will take every possible step to take the culprits to task,” he added. However, he said the media should also adopt a mechanism of its own accountability. Mr Sharif said he was well aware of the importance of free and fair media and was thankful to those who scribed truth despite all odds.